Impact Factory is great at inspiring and exciting audiences. We can provide corporate events and experiences that range from motivational duologues through to a full-on theatrical/orchestral, multidimensional interactive/experiential presentation. The core of our work and the reason for our continued success for over 17 years is our deep understanding of human communication, how it works and why it goes wrong. Our eclectic backgrounds include drama, psychotherapy, management, music, business, journalism, marketing, the arts and a factory-full of other creative disciplines making us able to deliver an experience, unlike any other corporate event you've witnessed before. 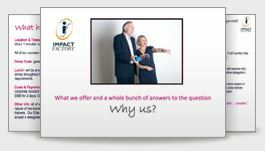 We can do anything from the full-blown bells and whistles or simply providing a superb key-note speaker from Impact Factory's 'stable' of Partners. The scale and dimension of the corporate event performance in which we present our expertise depends upon what you need and the size of your budget. We're at the ready to push the boundaries as well if pushing boundaries is right for your company and your event. Then we can work with you to create a memorable, visceral experience that will reverberate with your delegates and be remembered long after the corporate event itself. We have delivered or participated in corporate events for organisations as diverse as Mittal Steel, GlaxoSmithKline, Corus Steel, Eversheds and the London Borough of Tower Hamlets. We have worked with Blue Chips, Boutique businesses and local government and we have an in-depth insight into the 'make or break' act of communication between individuals, teams and organisations. Out of those experiences we have built a body of easy-to-apply processes and experiential techniques to both raise awareness and develop skills that can help smooth the sometimes bumpy road of understanding between people. If you know what you want from your next Corporate Event, then we can help you fulfil it. If you're not sure, we can spend time with you helping you shape your aims and objectives. With Impact Factory your event will make a difference.